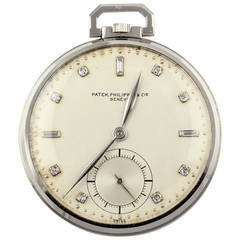 Patek Philippe & Co. Lady's Pocket Watch - Manual movement; 15 jewels. 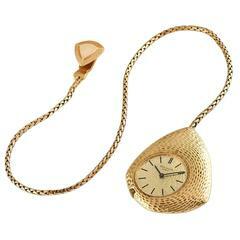 18k Yellow gold ( 32 mm ) with gold cuvette, swirl leaf and scallops, back with ornate overlay monogram. 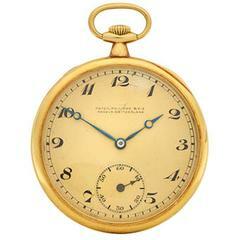 Enamel dial with radial arabic numerals and red five minute, gold Louis XV hands. Triple signed Patek Philippe original box. Extra crystal inside box.